"Set thy face to religion as a hanif, in the primordial nature from God upon which He originated mankind — there is no altering the creation of God; that is the upright religion, but most of mankind know not." To set, "turn," or "submit" one's face to or toward religion means to orient one's whole being toward worship and obedience to God. The present verse is thus taken by most commentators to be a command to follow the religion for which God created human beings. It is addressed directly to the Prophet or to all who hear the message. Some commentators take the first phrase to mean, "Follow the religion as a hanif and follow the primordial nature in which God created you". 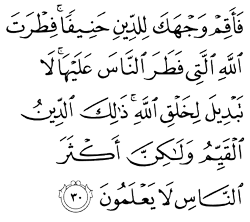 In another interpretation, primordial nature (fitrah) modifies religion, which is referred to as "primordial" because human beings were originally created for religion, as in 51: 56: I did not create jinn and mankind, save to worship Me. As a hanif is understood by most to mean in a straight and upstanding manner, neither inclining nor adhering to past religions that have been altered or abrogated. Hanif is usually employed in the Quran with reference to Abraham, but in general, it indicates one who inclines away from misguidance and toward belief in the Oneness of God. To be truly devout (hanif) and incline toward the worship of God and away from idolatry is to live according to one's primordial nature (fitrah), in which all human beings have been created. One cannot change this underlying nature as a servant or worshipper of God, because there is no altering the creation of God. This phrase is also understood to mean that there is no change in God's religion; that is, there is no change in the substance or universal truths of religion, only in the forms in which these truths are revealed in different religions. The reference to the fitrah is read by some to mean that human beings are born for Islam, so that anyone who follows any other religion is "astray" or "misguided". But al-Qurtubi maintains that it is impossible for the fitrah mentioned here to be Islam in its particular sense, because "Islam (submission) and iman (faith) are declaring with the tongue, embracing with the heart, and performing with the limbs," implying that if fitrah pertains to the original human nature, which is related to the spirit, it cannot pertain to the specific practices of a particular religious tradition because these can only be performed while a spirit resides in a body in this world. From this perspective, the upright religion could refer to religion as such and thus to any religious practice that accords with the fitrah. Nonetheless, most interpret upright religion as a reference to Islam in particular. Islam emphasizes that all human beings are equal. They are equal at the point of birth and equal on the Day of Judgement. They are given the same duties and promised the same reward. Thus, their equality in God's sight is complete. People, however, create all sorts of standards to raise some people high and keep others down. Islam does not recognize any such standards. The only criterion that raises some people above others is their being pious and God-fearing, provided always that they maintain this throughout their lives. This is stated clearly in the Quran. The Prophet (peace be upon him) further emphasized it in a number of statements and traditions. This hadith describes the Prophet's attitude to people's situations on the Day of Judgement. Those whose life is characterized by fearing God and piety will be the ones who bring forward their deeds hoping for a rich reward from God. They are certain to have the Prophet's support and God's reward. They are the ones to be given a position close to the Prophet, because their actions in this life confirm what they profess of accepting the Islamic faith and implementing it. The Prophet acknowledges that kin relationships may bring some people closer to others. Thus some people might be closer to the Prophet by virtue of blood relations, but he warns here that it is actions that count on the Day of Judgement. He further paints a very vivid picture of those who rely on being related to him for their salvation on the Day of Judgement while not doing enough to save themselves. They come carrying stuff of this world on their shoulders. This is a reference to anything, material or not, that people gain unfairly in this life. As they have to account for it, they carry it on their necks. The Prophet further warns that those who profess to follow him will appeal to him for help, but he will not be in a position to help them. He will simply turn away because he cannot help anyone except those who, in this present life, truly follow him. They might commit some sins, but they always seek God's forgiveness and try to rectify their deeds. It is such people that hope to benefit by his intercession on their behalf. As for those who deliberately wronged others and got away with things to which they had no rightful claim, persisting in their misdeeds and showing no sign of repentance, they will carry their heavy burdens and they will have no one to support them as they face God's reckoning. Our society is currently being challenged by a spiral of problems — problems of a rare kind. We are troubled by countless incitements. We are faced with depravation, contempt for values, decadence that leads to desultoriness, addiction to pomp and vanity, avarice and indulgence in pleasures, worldly ambitions and wishfulness for eternal life in this world, and — to be able to attain these ambitions — Machiavellianism that unscrupulously legitimizes all sorts of means. While our hearts and souls are paralyzed by these devastating afflictions, there are also many other cases of baseness. They come in the form of outrageous indifference, embarrassing heedlessness, being silent like "a mute devil" in the face of sheer injustice, and closing our ears to the uproars of despots and oppressors and to the cries of innocents and victims. This level of wickedness has been rarely witnessed in history. Notwithstanding all these concentric deviations, there have been devotees of love who have always taken on all the risks and moved forward on their path of resurrection, even at the expense of their own lives and regardless of the bumpy road ahead. These devotees have tied their lives to the wellbeing of others and have always breathed with this lofty ideal. They have lived these sentiments joyfully; they rose with hope and moved with disregard for worldly ambitions. As they took refuge in the All-Patient One, they never slowed down while marching on the path of the Prophets, despite all the complicated and insecure directions, unyielding hurdles, and merciless deviations. Never deterred by these challenges, they preserved the purity of the sacred in their hearts and the glory of their ideals. They have been fully aware that their lives are transient and their strength limited. They have disassociated themselves from their individual powers — to the extent of their good judgment — and sought refuge under the unlimited strength of the Almighty and His Willpower, by way of which their drops turn to oceans and their atoms to suns. Indeed, what doesn't exist comes into existence, and what has no value becomes priceless, in this way. The Almighty's favours are also dependent on the self-relinquishing ones who have turned to Him. These devotees of love have strived hard even during the direst of times: when time — time that has been detached from the One — has been disloyal and feelings have turned to delirium; when brute force has run amuck and pursuing a life of prophetic virtue has become extremely difficult. Through it all, they've continued on the path even when the future has become obscured.